Which defense has the 'Tenacious D' of nicknames? Published: May 15, 2012 at 09:18 p.m. 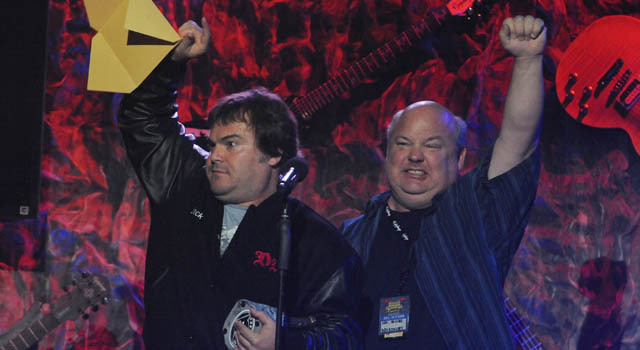 Updated: Aug. 4, 2012 at 03:30 a.m.
Tenacious D released its latest album, "Rize of the Fenix" on Tuesday, and whether you care for the comedy shock duo or not, you have to admit it theirs would be a pretty cool nickname for a defense, right? And that got me thinking about how defenses don't have cool nicknames anymore. There used to be tons of them, but now, nothing. With that in mind, I'm going to list the top six nicknames for defensive units. Killer B's (Miami Dolphins): A great nickname that was ruined by the current trend of using initials solely for nicknames -- right, L.T.? New York Sack Exchange (New York Jets): A great nickname ruined by Mark Gastineau. Dome Patrol (New Orleans Saints): This sounds like a boy band. Gritz Blitz (Atlanta Falcons): This sounds like a Southern boy band. Blitz, Inc. (Philadelphia Eagles): This sounds like a hip-hop boy band. Homeland Defense (New England Patriots): Make your own "Spygate" joke here. SWAT team (Cincinnati Bengals): Good, but doesn't make the cut. Monsters of the Midway (Chicago Bears): I only included this because many of you will flame away in the comment section if I don't. But remember, this name was originally designated for the University of Chicago before it was given to the Bears. So that takes them off the list. I hate to give credit to Denver Post columnist Woody Paige, who coined the term in the 1970s, but this was a fitting moniker for the dominating 3-4 defense of the Broncos, led by Lyle Alzado, Tom Jackson and Randy Gradishar. The Orange Crush led the Broncos to Denver's first Super Bowl appearance in Super Bowl XII. This name became the ultimate rallying cry for the Dolphins' defense after Tom Landry insulted the unit prior to Super Bowl VI, saying he couldn't remember the names of Miami's defensive players (in his defense, the Cowboys won, 24-3). But it became a fitting tribute to the unassuming defense, which led the Dolphins to a perfect season in 1972. "Doomsday" is typically reserved for describing Tony Romo's performances in December, but there was a time in the 1960s and '70s when the Doomsday Defense served as the foundation for the Cowboys franchise. The Doomsday Defense stretched from the early days of Bob Lilly and reached its height when Randy White and Harvey Martin were selected as co-MVPs of Super Bowl XII. This name came from a popular song from the 1950s and is probably easily the most identifiable among people who didn't follow football at the time. The Purple People Eaters -- whose motto was "Meet at the quarterback" -- described the Vikings' front four of Alan Page, Carl Eller, Jim Marshall and Gary Larsen. No team has embraced the town it plays for quite like the Steelers have, so it seems only fitting that the team's defense was as tough as Steel. The original nickname applied to the defensive line with members "Mean" Joe Greene, L.C. Greenwood, Ernie Holmes and Dwight White. But now the nickname applies to the entire defensive unit. It might be hypocritical to list the Fearsome Foursome after the nickname was used to describe other units (don't act like you knew that). But the Fearsome Foursome is synonymous with the Los Angeles Rams of the 1960s, which featured Deacon Jones, Merlin Olsen, Rosey Grier and Lamar Lundy. Easily the best nickname ever applied to a defensive unit. Send along new nicknames for current NFL teams via Twitter or via Facebook Also be sure to catch the latest on the Dave Dameshek Football Program. "Men in Black: The best all-time Raiders..."